Sales Professionals | Sell, Lead, Succeed! Are You A True Sales Professional? Selling has always been in my blood, and I became a sales rep for the first time in 1999. Since then, I have learned a “couple” lessons along the way performing several different roles. Sales reps sell products and/or services, and can make a good living. In addition to the standard responsibilities, true sales professionals achieve more success by taking their game to another level and have long, prosperous careers. Which one do you want to be? Having a complete understanding of sales cycles, and mastering product knowledge is imperative for success. Most companies only focus on product training, because that is what everyone does. While others also give insight on sales processes from first greeting/meeting all the way through closing the sale. That is where things get scary! Many reps get a false sense of security that this is all they need to know to become successful. In reality, this knowledge only equips them to be “run-of-the-mill” sales reps. The world is full of “status quo lovers”. The following information will give you the potential to become a true sales professional and exceed goals for years to come. Your job is to sell products and/or services, but people don’t like being sold to. How weird is that? The faster you learn that listening during a customer/prospect interaction is more important than speaking, you will be well ahead of the curve. When you become a consultant providing solutions to their current situation, success will follow shortly. Anyone can regurgitate information and spew it out. Just ask the student who memorized textbooks and got straight A’s, but could not cut it in their chosen profession. The “relationships” aspect of a sales team is critical to its overall success. You need to give unconditionally, and not be afraid to share ideas and concepts with each other. I always love to share templates for presentations, bulletins that I distribute to customers or various ideas that help improve my territory. If you can make your co-workers lives’ easier, why wouldn’t you? The good karma will come back some day. Celebrate each other’s victories, and don’t you dare get jealous if your colleagues get better results! Put together recovery plans to improve ASAP. Things don’t always turn out the way that we want them too, so be there to support each other when failure occurs. Keep communication lines open to move past bumps in the road. And last but not least, treat inside sales and support groups with the utmost respect! They are pivotal to the team’s overall success, and are not personal assistants. I underestimated the power of being exceptional in this area for a long time, and it affected my results earlier in my career. Planning a schedule as far ahead as a month or more makes things flow better. Putting emphasis on getting out of the office regularly at scheduled times keeps you on track. Paperwork and other less urgent items can be handled before or after prime selling hours. I once worked for a manager who stacked the sales rep’s desks in the warehouse to emphasize that he did not want them in the office for very long in the morning! An extreme action, but he made his point loud and clear. I always make the disclaimer that priorities over-ride schedules with the following example. If you have a lunch booked with a prospect where the potential is unknown, and your largest customer has a crisis shortly before the appointment, what would you do? You have to understand who your biggest customers are, and the level of service that they need. By the way, do you spend 80% of your time with the 20% of your customers who buy the most? If not, it is time to adjust your schedule and give them the attention they deserve. Early in my career I had a Sales Manager tell me that one of the best indicators if a rep was doing a good job, is if they rarely heard from the rep’s customers. Be very responsive to your customer’s needs, and take care of them in a timely fashion. If you need help, get it. Never blame others in your organization if they do not respond to you and a customer is left waiting. It is your responsibility to get things taken care of, no excuses! Keep up to date on everything that your manager requests. It may be weekly call reports, inputting of sales calls and/or opportunities in to a CRM (customer relationship management) program, or general administrative items. 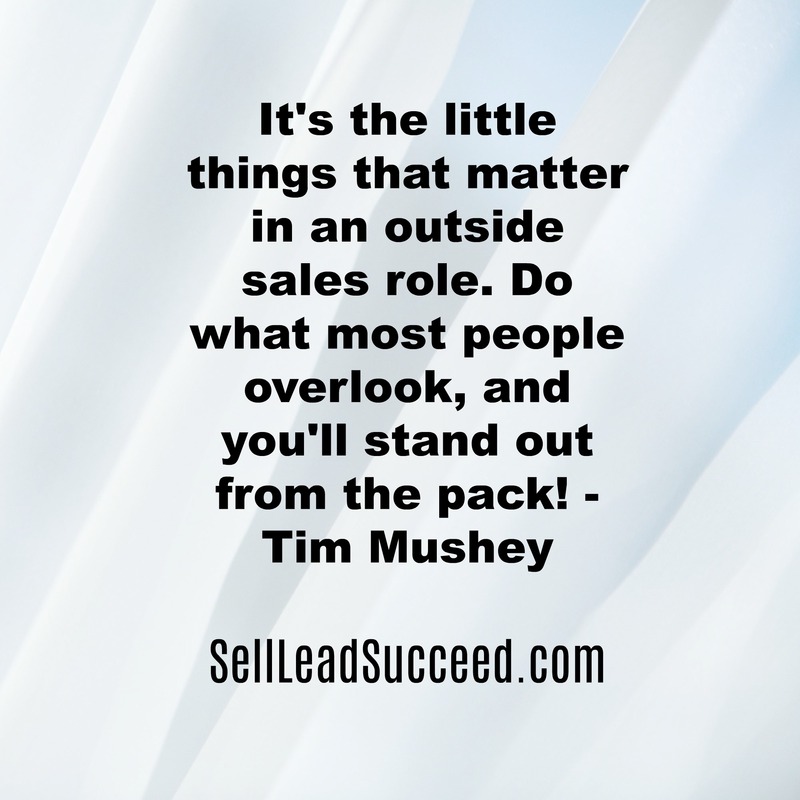 Successful sales people always do what is asked of them, even if they don’t like to. Anyone can take the path of least resistance. It is easy to only deal with customers who have great relationships with you and your company, and only sign up prospects that there was little effort involved. But what about handling those difficult customers in your territory, or bringing on prospects where things were more challenging? From those clients, huge growth can occur. In one role I had, the previous sales rep stopped calling on a long-standing account because he was not getting along with the staff. Sales plummeted. From the time I came on board, it only took two years for the account to become the largest in my territory. Over time, you will acquire “street-smarts” and know when to walk away from business, but more importantly when to move forward when the potential is right before you. Don’t hide behind email or text messaging when problems arise. Face-to-Face is still the best way to communicate, and sometimes you “have to take a punch” to make things right. It is easy to see through reps whose only agenda is to close sales as quickly as possible, with minimal effort. But the secret is to really get to know customers on a personal level, and make them feel important. It is common knowledge that people like to deal with those they like, know and trust, so take steps to solidify relationships as soon as possible. Get to know special details about customer’s families, their hobbies or even what they take in their coffee. Take notes, keep files and refer back to them before each meeting. I guarantee that they will be impressed with what you remembered, and there is a very good chance that your competitors did not take those lengths to learn about them. Becoming a true sales professional takes time, and long-term commitment to grow and learn every day. Sales reps tend to be negatively stereotyped, but those that stand out from the crowd, truly care about their customers and can be counted on at a moment’s notice will always be in demand. Are you in this for just a job, or a long, prosperous career? You make the choice. Really think about that for a minute. How different would their mindset and attitude be if they had a great start to the day? Don’t get my wrong, I am not asking you to beg for the sale, or hang on to their leg as they try to leave the store. But you get the idea! For sales reps, business people and anyone trying to sell “Widget XYZ”, listen up…. You should have laser focus from the moment the calendar changes to a new month, and start that selling period with a “Bang”! A strong first day or two (or even a week) sets you up for the rest of the month. You will feel more confident, have a bounce in your step and presentations will flow more naturally. Heck the challenges won’t even feel as painful! 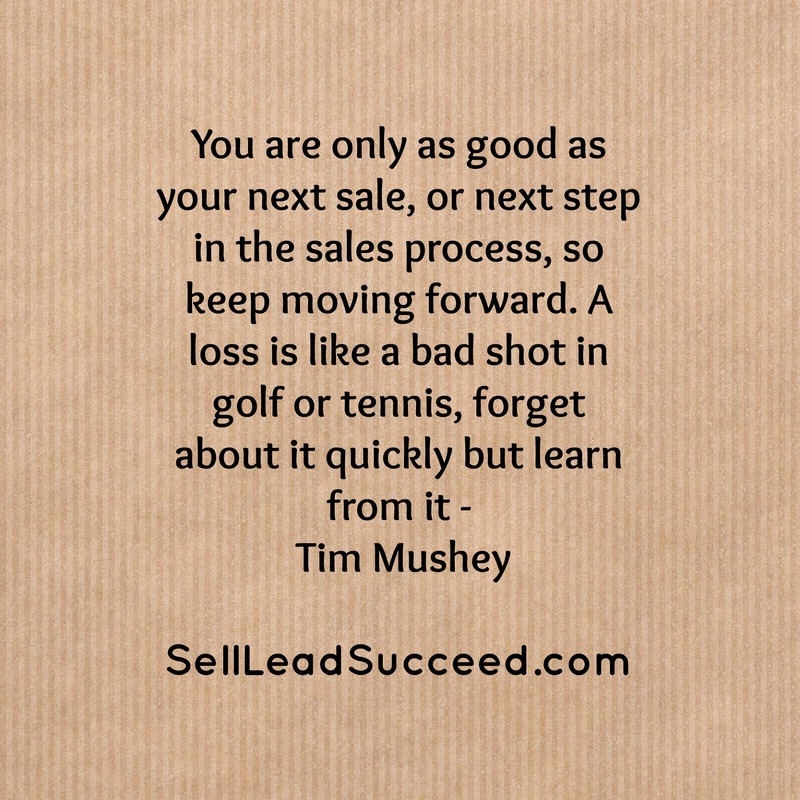 You won’t feel as much pressure to sell, because you are already well on your way to reaching the monthly goal. Think back to those months that you had a fantastic start vs. a poor one. One felt great while the other one felt like the weight of the world was on your shoulders. I can vividly recall having both types of feelings, and one is obviously better than the other! Sales is a lot like sports, and when you are “feeling it”, good things happen. Try “feeling it” when you have only achieved 25% your monthly goal with three days left in a month. OUCH! 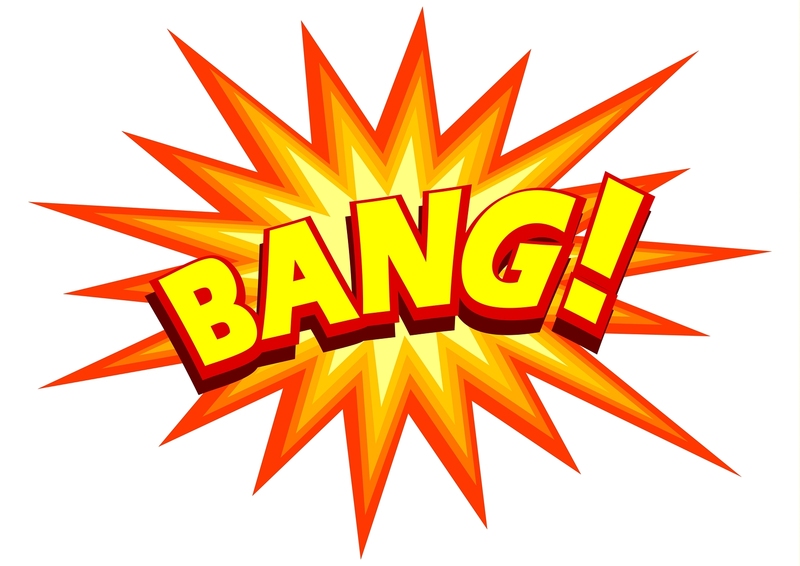 Get in the mindset that NOTHING will get in your way to starting a month with a “Bang”! Don’t get distracted in the office doing busy work and returning email. Focus on a detailed sales plan for that first week and don’t deviate from being in front of customers unless absolutely necessary. I would love to hear if a very focused sales strategy for the first week of every month helps your results. Keep me posted – I would love to hear from you! The Five Star 5 – Key Phrases For The Sales Industry In The New Year! As we start a new year, people in the sales profession get to “wipe the slate clean” and start all over again. Last year’s results are in the rear-view mirror, and it is game on once again! Optimism/Positive Outlook – This is the only way to go! Have fun, keep smiling, and just relax – If you are prepared, eager to learn and stay patient it will all work out! DO NOT Be Just A “Professional Visitor”! I had never heard this phrase before in the context of a sales role, but I knew exactly what he meant. I forget the exact content of the note, but I am sure it was very colorful based on how he typically corresponded with us. What he was basically saying was it was close to month end, and we needed to secure orders. A sale rep’s job description did not include going to just visit accounts. Clear goals needed to be made and achieved on each call. I heard him loud and clear. Going to see accounts just for the sake of seeing them and not moving closer to securing business was rarely, if ever a good idea. Certainly build rapport with customers, and get to know personal details about them, but always have a “moving business forward” component of the call. You don’t have to complete 10 objectives or something drastic like that on every call, but aspire for at least 2-3. When I had limited time with an account, I may have only had one goal, but I made sure it was a worthwhile one. The sales profession can seem complex on the surface, but at the end of the day systems can be simplified to insure success long-term. Make achievable goals for each call, and do whatever you can to not stray from the plan. Anyone can go in and just visit people, but the real success stories come from those who plan and organize ahead of time, and are always thinking about closing business! 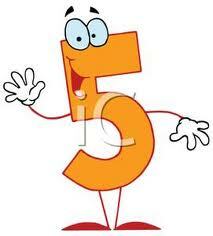 The number five has long been considered a number of power and good fortune. It is the number of harmony and balance. It is also known as the number of the divine grace. The number Five is also called the Pentad. Known as the living principle, the number five indicates the action of the active principle of form. I heard about this video a few weeks ago, and finally checked it out last night. It is very funny. If you want to fast forward, the first 45 seconds of this 3 minute clip is music! Have a great weekend.